Mac and Tosh (Mac ‘n’ Tosh) have been a double act since the day they arrived as puppies back in 2006. They have done everything together, with each adopting their individual style. Mac is a bigger, slower dog, with the classic determined attitude of a terrier. Tosh is smaller, leaner and more energetic, but equally stubborn. The two dogs were house-trained together, vaccinated and wormed at the same time, and they were even castrated on the same day. They get on well, eating dinner in adjacent bowls and sleeping close to one another. They even had an adventure together a few years ago. The family had been out at a funeral, and a friend was looking after the two dogs for the day. They somehow managed to escape from the back garden, going for a wander around Bray. Mac was found within a mile of the house on the same day, but Tosh had vanished altogether. Luckily, he had been microchipped, and the following day, a call came in from Dun Laoghaire, eight miles away: he had been found. Tosh had been seen getting off the DART in Dun Laoghaire on his own, and the woman who had spotted him took him home with her. She had then taken him out for a boat trip on her yacht because the vet was closed, and she couldn’t have his microchip checked till the following morning. Tosh enjoyed the trip so much that after dropping him home to Bray, the lady told the family that he could come back for another boat trip whenever he liked. Apart from enjoying adventures together, Mac and Tosh have the misfortune of suffering from the same disease: an allergic skin condition known as “atopy”. This has a strong inherited, genetic component, and it is no accident that both dogs are affected. 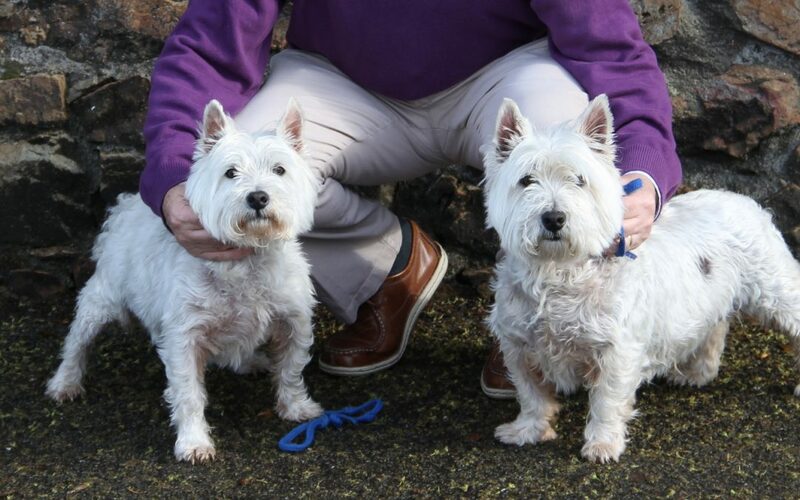 Atopy is so common in West Highland White Terriers that it is known as “Westie Skin Disease”. Whenever I meet an owner with a Westie puppy, I strongly advise that they take out pet insurance, because skin disease is so common in the breed. Mac developed the skin problem first, when he was just one year old. Tosh followed four years later, when he was five years old. In both cases, the condition started with itchy skin along the back, spreading gradually to include sore ears, painful feet and an itchy underside. Atopy is caused by an allergy to tiny particles in the air, such as pollens and dusts. It’s like a skin version of hay fever. Diagnosis involves a series of tests to rule out other causes of itchiness, including skin scrapings (to rule out parasites), food trials (to rule out food allergy) and skin biopsies. Finally, special blood tests or intra-dermal skin tests can be carried out to identify precisely which pollens and dusts are causing the itchy skin. Once the diagnosis is made, some dogs are treated with so-called “hyposensitisation”: this involves the regular injection of tiny amounts of the pollens and dusts that cause the allergy. The body’s immune system gradually learns to tolerate the substances, and the allergic reaction eventually calms down. Hyposensitisation does not suit every case, and the Gallaghers decided to take a different route with their two dogs, which means regular anti-inflammatory medication to prevent the skin from becoming itchy. Each dog gets two little tablets every second day, as well as a special medicated bath twice a week. It’s part of their routine, and it works well: neither dog itches at all these days.